Here's the latest comic for Investing.com. 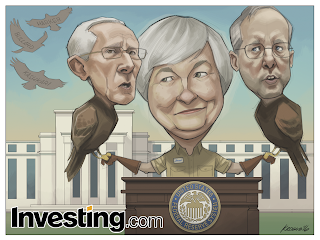 This week's topic is the hawkish position taken by several officials at the Federal Reserve. 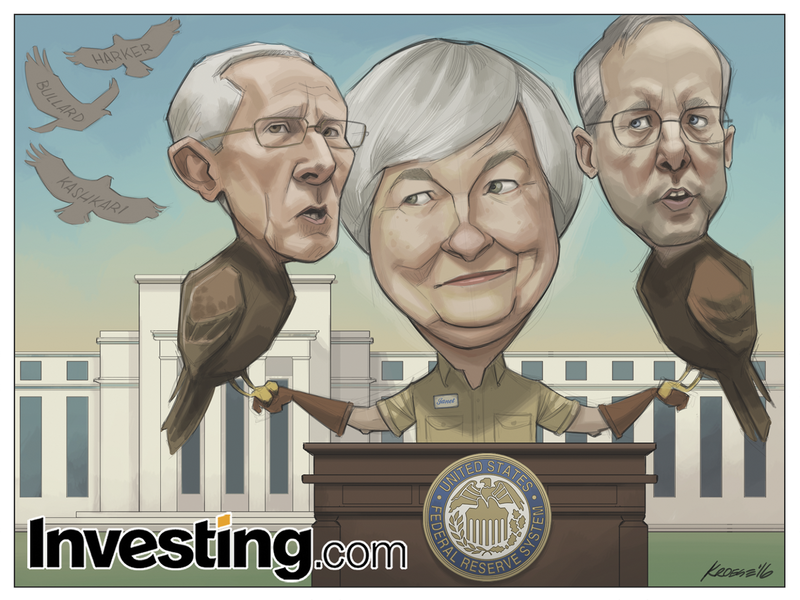 The team at Investing.com asked me to draw Janet Yellen (dressed as a bird keeper) standing on the lawn in front of the Federal Reserve Building and behind the Fed podium. On both hands, Yellen would have a hawk: one with the head of Stanley Fischer and the other with the head of William Dudley. In the background, I was asked to include three more hawks flying overhead with the names Harker, Bullard, and Kashkari. This one wasn't exactly a cake walk. Three characters is a lot for a one-day turnaround. 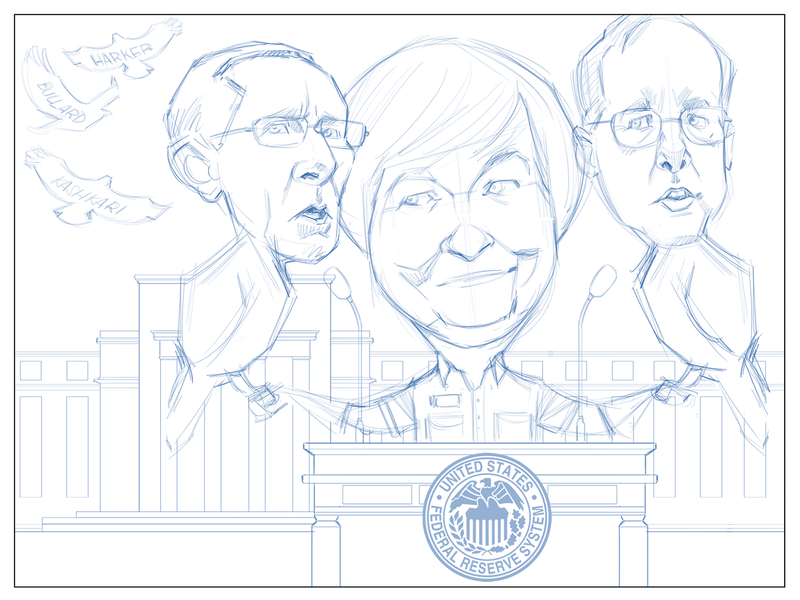 I probably could have re-used older drawings of both Fischer and Yellen, but I decided to draw them from scratch. I guess I wanted the challenge. And I think it turned out pretty well. 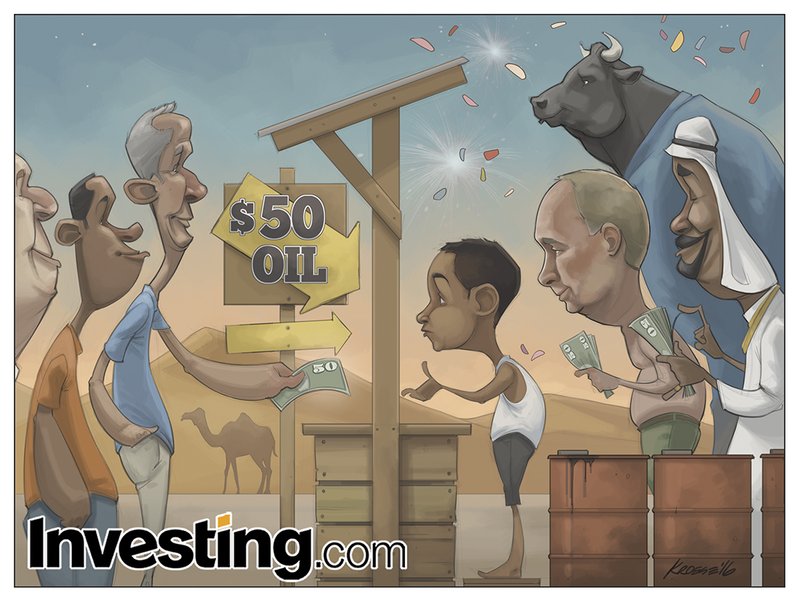 The composition isn't amazing, but I think the colors are strong and the caricatures are good. That's about as much as I can ask for. Here's the latest financial comic for Investing.com. 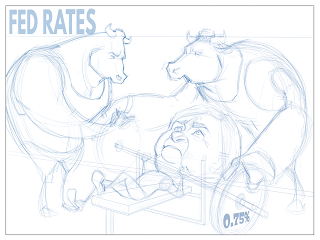 This week's subject is the market's effect on proposed interest rate hike. 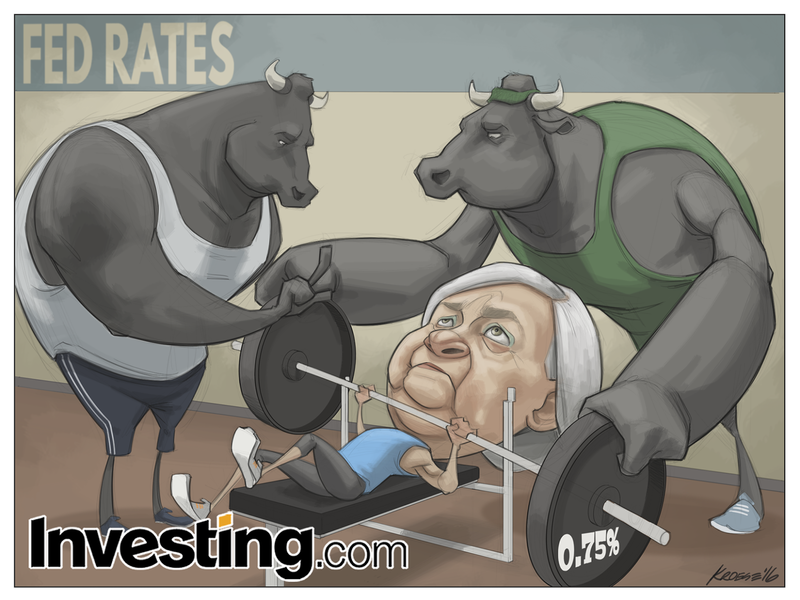 The crew at Investing.com asked me to draw the following: Janet Yellen attempting to bench press a set of weights reading "0.75%" (the proposed interest rate). Preventing her from doing so would be two big bulls (the market). 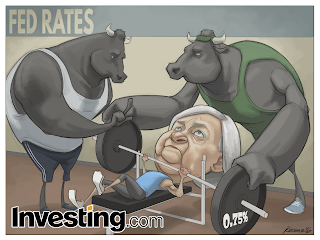 One was to be actually holding the barbells down and the other was to be sort of taunting Yellen with the "Oh no you don't" hand gesture. I was also asked to include the words "FED Rates" on the wall in the background. I chose a different angle this time around. 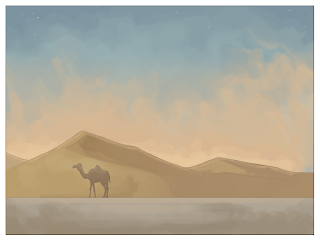 Typically, because time is so limited for these comics, I'll essentially draw the scene as a straight shot (with the camera on the same level as the characters). But this time the camera is raised up slightly and looking down at the scene. 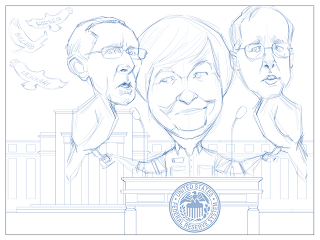 I figured a side shot might not work as well given that the barbells might block Yellen's face. Also, this angle seemed like it would be more interesting to look at. I think it IS a more dynamic, interesting angle. But it was a lot more work to arrange and draw the scene this way. I'm not used to arranging things like this, so it doesn't come naturally or easily. And I'm still not completely sure I drew it convincingly. 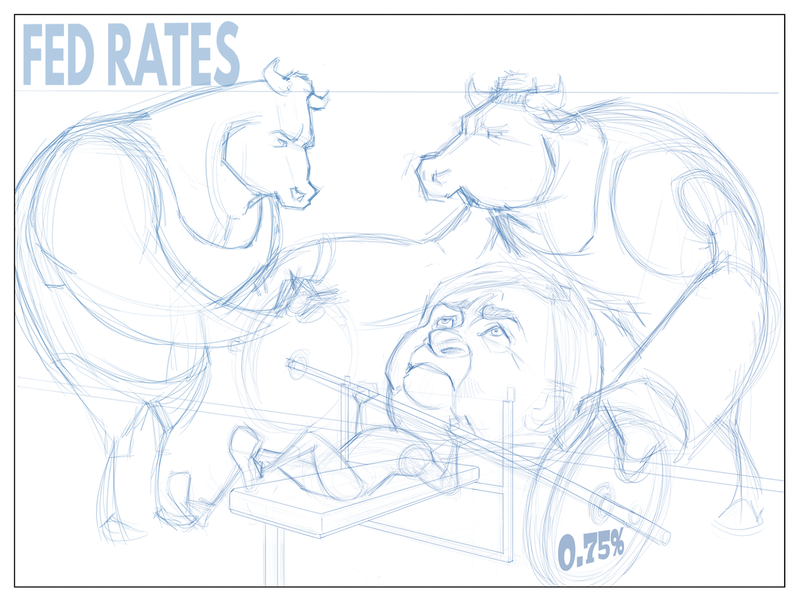 The bull in the white tank top, for instance: his head/face angle seems off. Still, I think it was a good effort, and I'm going to make more of an effort in the future to try different angles and perspectives. Seems like a good skill to build up. Plus, I could use the practice. 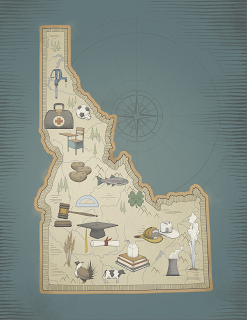 I was contacted a couple of months ago by the editor of a magazine called "Here We Have Idaho", which is put out by the University of Idaho and covers all things UI (academics, research, alumni, etc.). She asked if I would be interested in creating an illustration for the cover and I (of course) jumped at the opportunity. Projects like this can begin from any number of starting points. 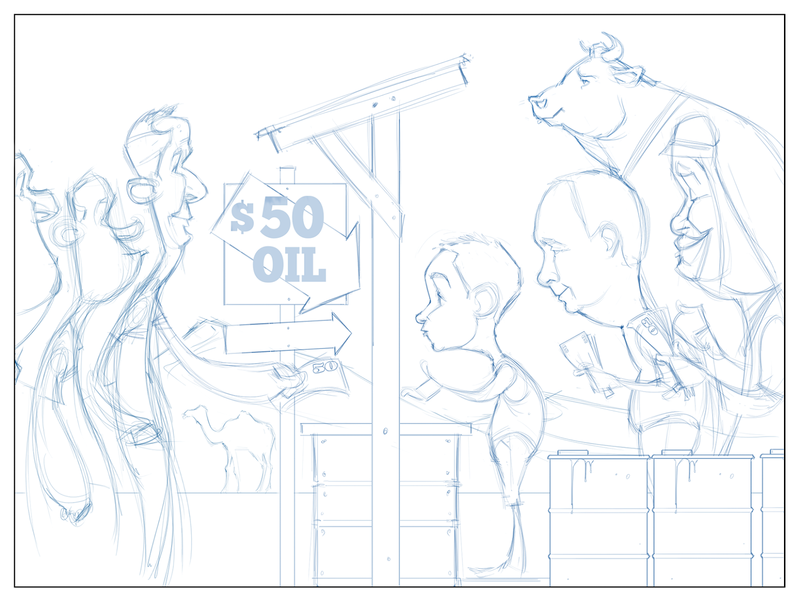 Sometimes I'm asked to imagine ideas and concepts from scratch. In this case, the editor and art director already had a pretty solid idea and approach for the cover. 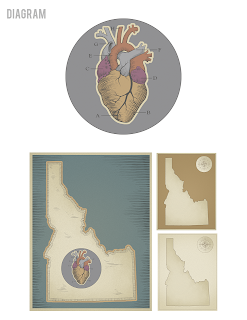 The idea was a map of the state of Idaho, drawn in a vintage style. 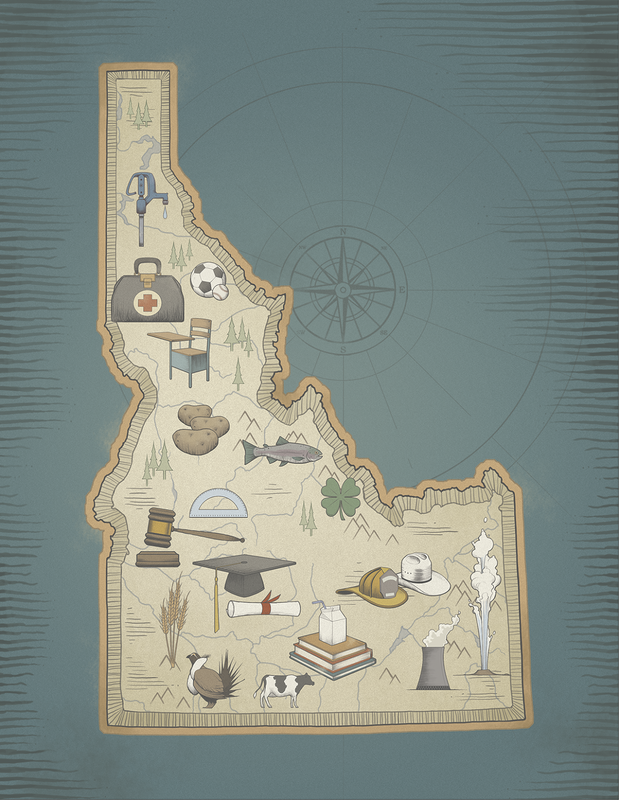 The map would feature graphic elements/icons (drawn in that same style) representing articles within the issue covering a wide variety of current projects being spearheaded by various departments and colleges within the university. So the HWHI team already had the subject matter and a general style they wanted to employ. One: To create a set of concepts that distilled that idea into a style that fit with the goals of the issue. Two: Once a concept was chosen from that set, draw that concept. So, first things first: The concepts. The word "vintage" can mean a lot of things. What era? Usually, when people say "vintage" they mean 1950s and 60s. But the word can refer to pretty much any time period before the one we're in right now. Since I'm a fan of mid-century aesthetics, I created two concepts that used some of the visual elements of design and illustration from that time and a third concept from earlier (20s and 30s). Travel Poster: The style from these posters is oft-imitated these days. Perhaps a bit too much. But I can't resist the bold colors and stylized imagery of illustrators around that time. It has a built in nostalgia factor, even for a dude born well after these aesthetic trends went the way of the Cold War. Travel "Stickers": The design of the icons in this concept were based on those stickers people used to get when they traveled to various hotels. They'd stick them to suitcases and steamer trunks. They were badges of experience and always beautifully drawn and designed. Textbook Diagrams and the 20s Map: Because old textbook diagrams are cool and so are 20s and 30s maps. Again, there's a kind of mood and gravitas built in to educational imagery from the past, even if the information being conveyed is complete malarkey. The latter of the set of concepts was chosen, but sans letters or numbers indicating various parts or points of the icons. 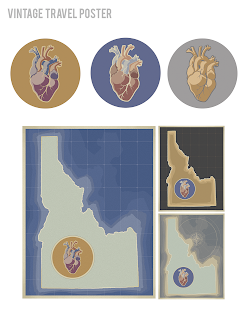 Because there were quite a few icons to be drawn, the final version took quite a bit of time to create. Each one had to be drawn in the same style with semi-muted colors and engraving-like shading lines. This isn't anything close to the style in which I draw naturally, so it was, at times, painstaking. Always fun, though. Reflections: A great project, overall. Drawing outside my typical style/approach was a challenge, but a fun one. 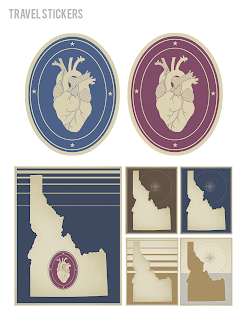 I think (well, hope, anyway) that the illustration has the vintage feel we were going after. The editor and art director liked it, which is always great. The only icon I don't like is the cow. For some reason, I never think my drawings of cows look right. My favorite icon is the geyser. I don't know why. Because I said so. That's why. Here's the latest financial comic for Investing.com. 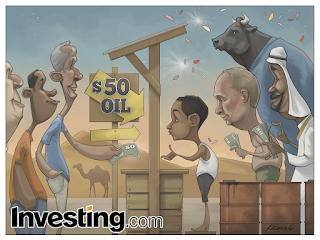 This week's subject is volatility in the currency markets and a concerted effort by multiple governments to devalue their own currencies. 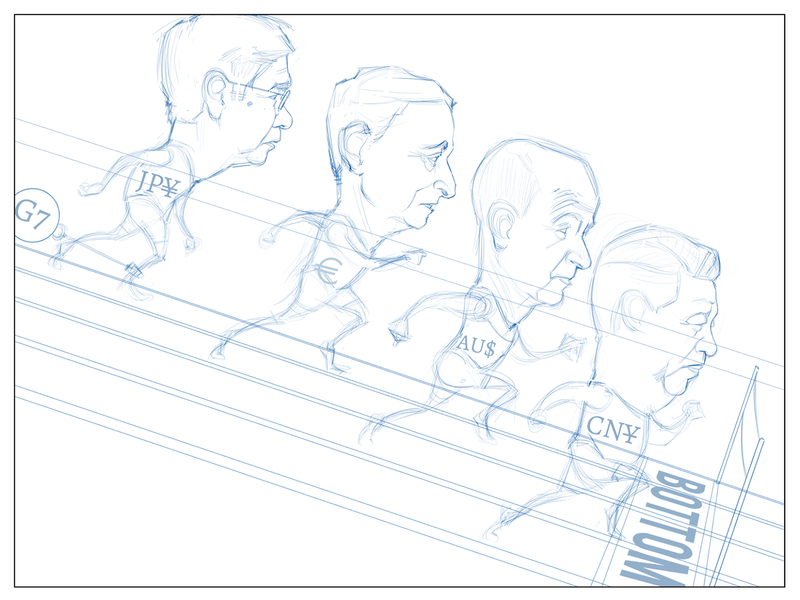 The crew at Investing.com asked me to draw a steep downhill track. 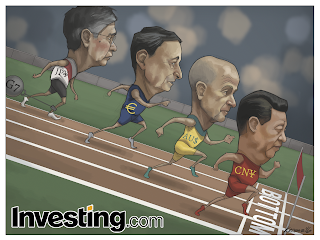 Racing on that track would be China President Xi Jinping, Reserve Bank of Australia Governor Glenn Stevens, EU President Mario Draghi, and Bank of Japan Governor Haruhiko Kuroda. They were to be racing toward a finish line reading "Bottom" and in the afore-mentioned order. I was also asked to draw a weight attached to Kuroda's leg, symbolizing the G7 decision that has hamstrung Japan's currency control efforts. This, it should be noted, was all explained to me. I'm not this well-informed on monetary news in real life. I'm pretty happy with the caricatures and the face shading on this one. I think they all look pretty solid and I think Stevens looks particularly good. I feel so so about the composition. The slanted track and the number of characters (and my decision to use a profile view of the scene) necessitated smaller-sized characters than I would have preferred. I'm not thrilled about the big, green field. 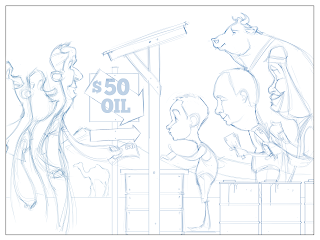 It seems a little too simple, but with four caricatures I didn't have time for anything too elaborate. Even re-using a background from an old comic, this puppy took me 11 hours. Overall: Hard work, but I think it's a solid result.